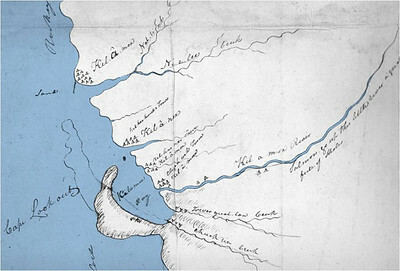 After hiking over Tillamook Head to buy whale oil from the Indians on the beach near today's Cannon Beach, Captain Clark drew this map of Indian villages. 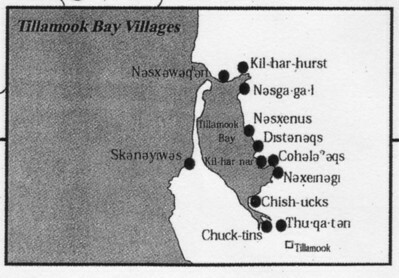 The map shows sites near today's Seaside that included both Tillamooks and Clatsops. 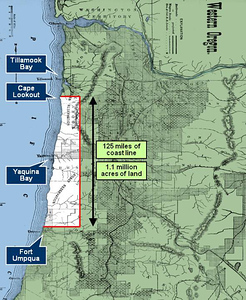 Researchers identified twelve Indian sites along Tillamook Bay. 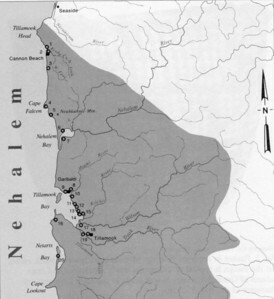 Indians working around the whale told Clark about villages to the south along today's Nehalem and Tillamook Bays. Clark drew this map based on their descriptions. 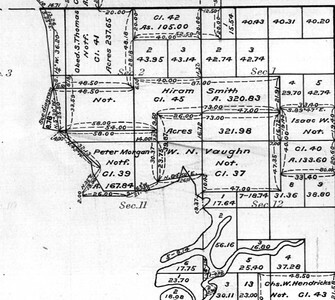 The map clearly shows a major village at Kilches Point. 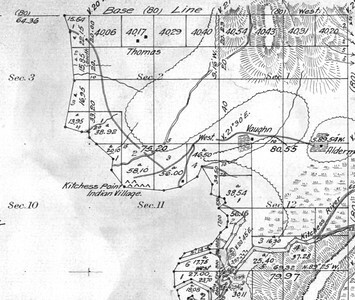 SILETZ RESEREVATION IN 1856 - Federal agents created a reservation for all Indian tribes of the Oregon coast. 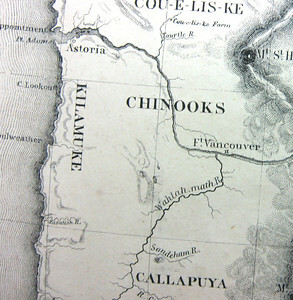 Forty years after Lewis and Clark, map makers still referred to the area south of Astoria as Tillamook country. 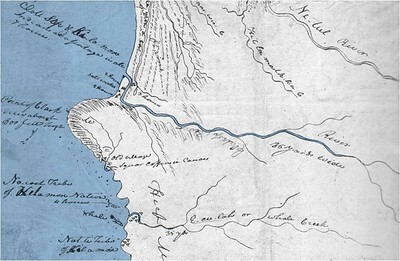 Newcomers had many ways of spelling "Tillamook" as in the case of "Kilamuke" on this map based on John Fremont's travels in the 1840s..
SILETZ RESERVATION 1865 - Whites wanted the rich oyster beds and farm lands near today's Newport, so persuaded federal authorities to open the area for homesteading. Indians were told to leave. 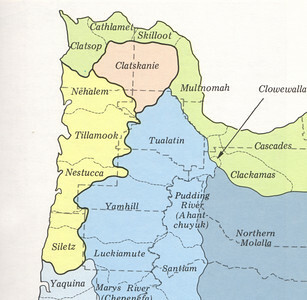 Tillamook Indians spoke a Salish language, shown here in yellow. 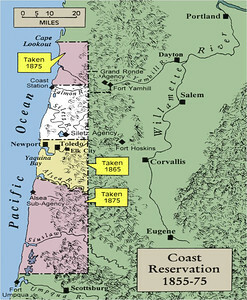 SILETZ RESERVATION 1875 - Twenty years after creating the reservation, the federal government had reduced its size by almost 80%. 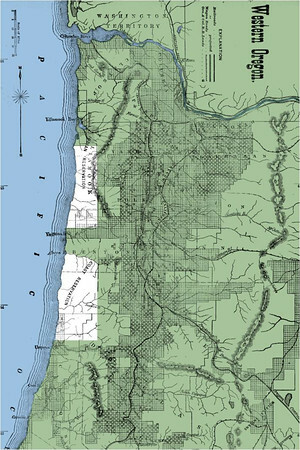 The northern half of Tillamook lands contained many villages between Tillamook Head and Cape Lookout.